Since this morning i got an error of 'no connectivity since no internet connection is availabe' i got no problems with my internet connection, what is really the problem? I'm getting connectivity problems with the community events links. They go to a non-working Warlight website. The only thing that could cause the "no connectivity since no internet connection is availabe" message to appear is your internet being being down for only a few seconds when trying to commit orders, download history, etc. @DanWL: Thanks for posting that. 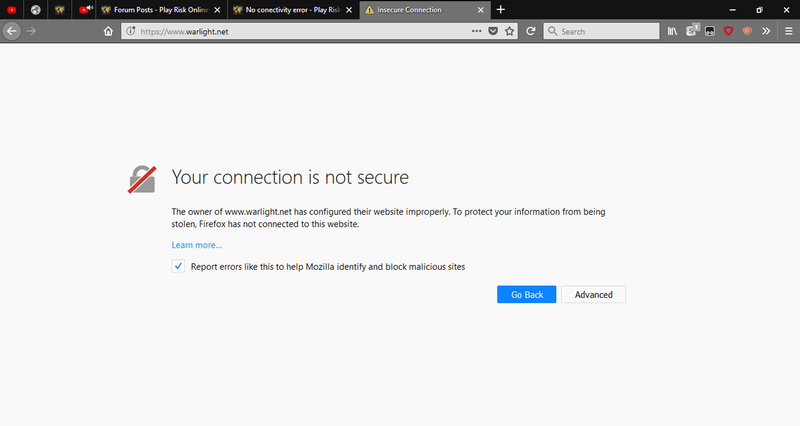 I messed up the cert for warlight.net (which just redirects to warzone.com). It's fixed now. also having problems connecting to games. Please clear your browser cache then refresh the page. This should fix it. Sorry about that.